Say you just created a large number of new Mail Contacts or you just created a new Distribution Group and you need to add the new contacts or a large number of users to the new group. There are multiple ways to do this. I’ll show you two of them that are useful in two different scenarios. Method One: If all of the objects are in a single OU and have some data field in common (created on the same day, department name, job title, description, etc. 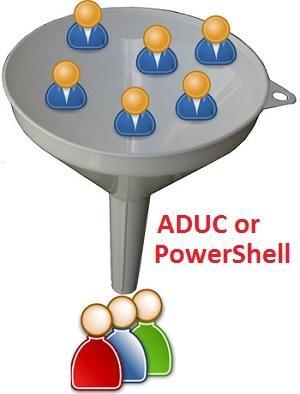 ), the simplest method is to use Active Directory Users and Computers. 1. Add that field to the visible columns in ADUC. 2. Sort by the column that has the common data. 3. Select all of the users or contacts. 5. Choose the group and click OK. Method Two: If the objects are scattered in different OUs in the Active Directory tree structure, it will probably be easier to use PowerShell.